Contango Oil & Gas Company, based in Houston, Texas, is an independent energy company engaged in the acquisition, exploration, development, exploitation and production of crude oil and natural gas properties offshore in the shallow waters of the Gulf of Mexico and in the onshore Texas Gulf Coast and Rocky Mountain regions of the United States. Our pride in the operational goals achieved and the progress made in positioning the Company for long term growth during 2014 were unceremoniously overshadowed by the sudden downturn in commodity prices that began mid-summer and that have continued to adversely impact the industry through the first quarter of 2015. However, the diligent efforts of our entire team in quickly reacting to the downturn has positioned Contango to endure, and potentially benefit from, the down cycle and has prepared us to resume the development of our asset base when commodity prices improve, and/or when service costs decline to levels commensurate with and appropriate for today’s commodity prices. Our balanced portfolio of producing oil and gas assets, our deep inventory of exploration and development projects, and our strong liquidity position establish the foundation for Contango’s long-term sustainability and capacity to create shareholder value. Today our proved reserve asset base is roughly 52% shallow water Gulf of Mexico and 48% onshore unconventional and conventional Texas Gulf Coast, and from a commodity standpoint, is approximately 65% natural gas and 35% crude oil and natural gas liquids. Our legacy natural gas operations in the Gulf of Mexico continue to provide us stable cash flows that we will use to test our oil and liquids weighted onshore exploration projects, and our development projects when commodity prices improve. During 2014, we drilled 40 onshore wells, which included 18 wells targeting the Woodbine formation in Southeast Texas; 19 wells targeting multiple formations in South Texas; two wells targeting the James Lime formation in San Augustine County, Texas; and one well on our new FRAMS project in Natrona County, Wyoming targeting the Mowry Shale. In the Woodbine, six of the wells drilled were on two multi-well pads to test the net recovery efficiency of 500-foot downspacing in our Chalktown area while another well in our Iola Grimes area targeted the Upper Lewisville formation using twice the number of frac stages, four times the amount of proppant, and fifty percent longer effective lateral lengths than our two previous attempts in the Iola Grimes area. In South Texas, 14 wells in Zavala and Dimmit counties targeted the Buda formation; one well in Zavala and Dimmit counties was drilled as a vertical pilot well to test the viability of the Eagle Ford Shale and other formations in the area; and four wells in Fayette and Gonzales counties, Texas were drilled on our new Elm Hill project. Of these 40 wells, 26 were on production by December 31, 2014, with 12 more to be placed on production at various times in the first or second quarters of this year. We are excited about the progress made derisking and further delineating parts of our portfolio during the year. We will continue to do that in 2015, but at a reduced pace as we balance the desire to continue to exploit the potential of our inventory with the desire to maintain our strong financial condition during this low commodity price environment. We have elected to defer any development-type drilling programs until a combination of higher commodity prices and/or lower capital costs provide superior return on investment economics over the longer term, i.e. rather than internal rates of return economics on high decline rate unconventional wells as many resource wells produce 60% to 70% of their PV-10 value in the first 18 months. Consequently, in this period of low commodity prices, and the associated lag on declining service costs still to be fully realized, we believe it is prudent from a value-add perspective to delay development drilling until prices improve and/or service costs decline further. However, we do have the flexibility, liquidity and inventory to significantly increase our level of spending should circumstances change over the course of the year. 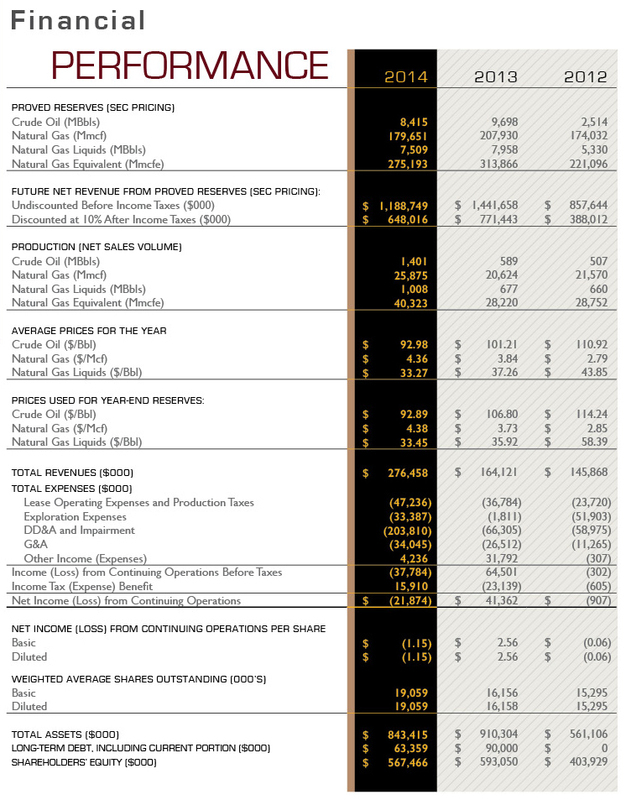 For 2015, we have budgeted approximately $51 million to be spent over three strategic exploratory or exploitation areas: 1) finish the test of downspacing strategy in our Madison/Grimes area using multi-well pads; 2) continue to test multiple formations in our new Elm Hill project in Fayette and Gonzales counties in South Texas; and 3) finish the drilling and completion of our initial tests in our Mowry and Muddy Sandstone exploration programs in Wyoming. This budget is approximately 73% less than 2014 levels, and is less than our forecasted cash flow, therefore we plan to use the excess cash flow generated to improve our already strong balance sheet. We remain very opportunistic about our 2015 projects. We will be dedicating a lot of effort to identifying new prospects, evaluating acquisition opportunities and hopefully adding high-value assets to our portfolio through both strategies. This is a cyclical business, and we will continue to manage our diversified portfolio and our financial condition to ensure the long-term sustainability of our company. We are optimistic about our long-term potential to fulfill our mission and create shareholder value. Our interests are aligned with yours; as the management team, the Board of Directors, and all of our valuable employees are shareholders in Contango. We thank you for your ongoing support. During the fourth quarter of 2014, we spud our first well in Natrona County, Wyoming (FRAMS Project) targeting the Mowry Shale, where we have the right to earn approximately 69,900 net acres. During the first quarter of 2015, we spud our first well in Weston County, Wyoming (N. Cheyenne Project) targeting the Muddy Sandstone formation, where we have the right to earn approximately 35,000 net acres. For 2015, we will finalize these wells and evaluate their results for a number of months to determine future drilling plans for these areas. 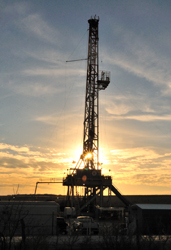 During 2014, we drilled 39 onshore wells in Texas, which included 18 wells targeting the Woodbine formation in Southeast Texas; 14 wells targeting the Buda formation in South Texas; four wells in our Elm Hill project; two wells targeting the James Lime formation in San Augustine County, Texas; and one well drilled as a vertical pilot well to test the Eagle Ford and other formations in South Texas. Of these 39 wells, 26 were on production by December 31, 2014. For 2015, we will place 11 more of these wells on production and drill two to three additional wells, including a fifth in our Elm Hill project. Our Gulf of Mexico assets currently account for 61% of our production, 52% of our reserves, and 48% of our revenues. During 2014, we installed a turbine type compressor of sufficient capacity, based on normal production decline rates, to service all ten Dutch and Mary Rose wells at our Eugene Island 11 platform. For 2015 and beyond, we have chosen to focus our capital budget on our onshore properties, due to our goal of limiting exploratory risk.